Sensational Sapphire and Diamond Cluster Earrings c.1920 [SH4905] - £2,500.00 : loveVintageDiamonds.com, Your Vintage Diamond Dreams Come True! Sensational Sapphire and Diamond Cluster Earrings. 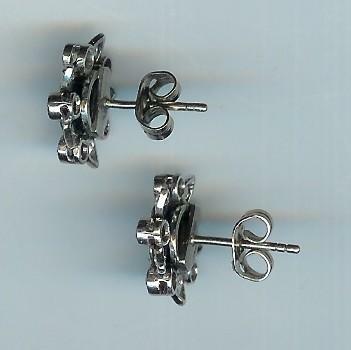 These earstuds are breathtaking in content and quality. They spread to approx. 13mms diameter. Each stud contains eleven rose-cut diamonds, and five sapphires. A four-tier cluster arrangement of flower and star. 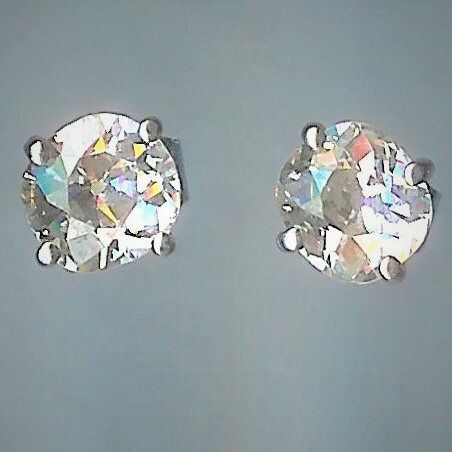 Total diamond weight over the pair is approx. 1.30cts. 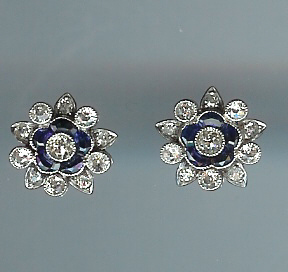 The sapphires are fancy-cut and set within a flower collet with mille-grain edges. All white settings and post and scroll fittings, tests as platinum. Overall weight 4.6gms.